In my last two posts, I emphasized the importance of understanding user behaviour and putting them at the heart of your marketing strategy. In this post, I’ll explain how a site redesign represents a huge strategic opportunity to run your online business more effectively. It’s an opportunity to better understand your users on site and your wider audience off site. However you feel about your current site design, it probably needs a revamp if you look into your web analytics and cannot instantly get an impression of who the majority of your customers are and what they’re interested in. Put another way, if every action a user takes on your site (aside from loading the index/homepage) does not better qualify their intentions then you have found a decent problem that is worth solving. Many companies sell more than one product or service or are solving a problem where two completely different markets intersect. Their customer persona is varied and those customer personas have very different information needs. For example, a toy site might need to appeal to parents, grandparents and children, with each persona requiring a different marketing approach. A hotel site might need to be suitable for new guests or group bookings and those in need of conference facilities. And recruitment consultancies might need to appeal to both job seekers and employers. Every customer persona is tied to your business margins so the better you can understand every visit that happens on your site, the better you can target your marketing campaigns to those customer segments that yield the best return on investment. It’s important to try to eliminate uncertainty at an information architecture level in such a way that goes deeper than front-end site design or user experience (UX). The truth is that all generic page types become problematic when you factor in the reality that not every user visits via the intended page (because search engines can surface any page of your site and social media users may visit via any page that is shared). In fact, the majority of visits to your site will not be via the homepage which means that even the best laid plans for building a conversion funnel on-site still face the challenge of new users entering mid-stream. Guiding visitors down the conversion path can be an imprecise science at best, especially when you’re dealing with a large website. As an Englishman, I’m prone to football analogies, and I think in this case the analogy is particularly apt: consider your site architecture as the football pitch and visualize your user personas as the teams playing on it. As a team moves down the pitch, the probability of converting (scoring a goal) changes. Similarly, as visitors traverse your site, they are qualifying themselves based on the content that they interact with, the page they entered from, and their journey across the content you have on offer can be used to reveal their customer persona. The solution is to design every page to qualify visitors in terms of their customer personas and structure your site in such a way that every interaction with every page generates what I call “implicit analytics” data. A site designed with implicit analytics treats every page load as expressing some tangible information about the user in relation to your business. There are a bunch of different ways to do this. You can configure OnLoad Events in Google Analytics or you can use your site architecture and folder structure to generate a similar data set. Using OnLoad Events or category index folders you can identify which information is most useful to the user. Organize your site information so that each page is in a navigation branch specifically designed for that persona. It will give you a much better sense of the effectiveness of your marketing channels as you can track the sources to everything in that folder or section. Also tagging your blog content to the same persona categories will give you a strong indicator of what social channels yield the most interest from different categories. For example, by using OnLoad Events to tag the content of the site to a specific category I was better able to target users from different channels with content that was more suitable for them. 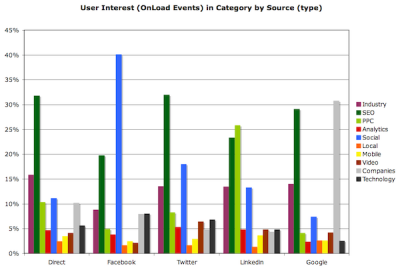 In this case, I discovered that users from Linkedin were overwhelmingly more interested in stories about paid search than users from other channels. Similarly, users from social networks like Facebook and Twitter were generally more interested in stories about social media. This knowledge alone transformed my approach to marketing each story. It showed me that if I wanted to grow traffic to the paid search section of my site, it was better to concentrate on Linkedin. It also showed me that if I wanted to generate more visits from social, I just needed to publish more stories about social media. You’ll probably be shocked at the disparity between usage of your site when you see it mapped to specific personas but that is where the opportunity for improvement lies. What’s more, using this implicit analytics method, you can now measure the impact of any marketing campaigns targeting that segment. What’s more, you can also assess the opportunity cost of not setting the user in the right direction. Although you can only assume that page loads of your homepage (index folder or page e.g. ‘/’ or ‘/index’) are all from interested parties, it is better to ignore that big number or to conceive of it in the same way as you might consider impressions counts for ads. In and of themselves, they don’t mean very much. 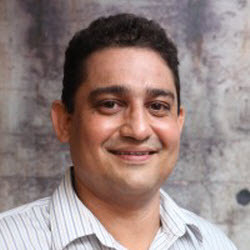 What’s important is who these visitors are – an intelligently conceived site architecture can help you know more about them and help them convert more often by creating tailored experiences for customer personas. Unqualified visitors, or a failure to make efforts to qualify visitors on your site represent an opportunity cost because you’re implicitly accepting a lower conversion rate than you could get if you were to more deeply engage your visitors. If there is a section of the site that is not effectively mapped to a target persona then there is an obvious opportunity to either incorporate it or, perhaps more importantly, abandon that section and redirect it or redesign it to better accommodate the audience intelligence you need. For example, take a site that has two target customer personas that are worth significantly different values to the business. Taken as a whole, the total traffic looks to be good and growing. However, mapping the pageviews to the personas shows a different story. The low margin persona dominates usage of the site, whilst traffic to the high margin persona pages is not growing significantly. 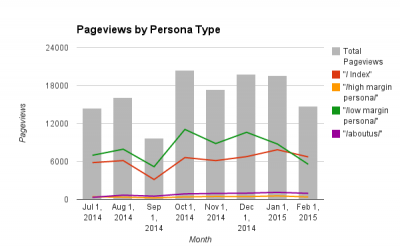 Comparing the share of pageviews from different personas on your site. With this information, where the focus needs to go on a website redesign to grow the companies’ profits becomes self evident. They simply have to do more around targeting the high margin persona! Practically speaking that may mean analyzing all of the pages in that section and boiling it down to what is really necessary for that target persona to make a decision. Remove the redundant pages that may be distracting or confusing the user and better incorporate the pages they are actively using. While everyone is reluctant to “lose pages” from a website, using persona based architecture and OnLoad Events means you can discount the macro trend and focus on the micro trend to measure the impact of these changes. The chances are that the impact of losing redundant and confusing pages is marginal and the gains from creating a more usable and less distracting site experience will far outweigh the losses. Eliminating pages is not “science,” but a data driven creative process. You are streamlining your site information rather than discarding, so you may need to merge pages or incorporate specific elements from the pages intended for deletion into another page. In general you will need to use judgment and conceive of your site within a general thematic hierarchy rather than a specific one. As this is a creative process, despite the data, you may have to make some somewhat arbitrary calls about what each structural decision amounts to. But have confidence to take these creative risks! And remember that you’re really just doing it for the sport of conversion optimization. Put simply, you are using data points to reset or redefine the terms of the game. Just like in football, the game is not won until the referee blows the whistle. Yes, the number of goals scored is part of the overall design of the game but fundamentally it is secondary to the actual playing of the game itself. The same goes for designing the way you understand your web visitors. If the current data points are not transforming every variable into an effective player on the pitch now, then they need to be sent off. Don’t be a slave to data – elevate your better judgment and think like a ref!